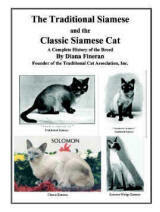 FREE North American Traditional Siamese Breeders List of TCA, Inc. COLORS: Siamese: Seal Point, Chocolate Point. Snowshoe in Seal Point, Chocolate Point and Seal Point Mitted, Chocolate Point Mitted, Seal Mitted, Chocolate Mitted. COLORS: Seal Point, Chocolate Point, Blue Point and Lilac Point. With this list there is neither an expressed nor an implied warrantee of any kind provided by this Association or any of it's members, especially with regard to: 1) The soundness or health of any animal purchased, 2) The integrity of any breeder referenced in this list, 3) The fitness of use or suitability for breeding or showing of any cat purchased, 4) The accuracy of any information provided within this list, 5) TCA, Inc. has a voluntary Cattery Inspection Program. The rating given those Catteries participating is listed below their address. This approval is revocable in the event of deterioration in the conditions or care. All disclaimers apply regardless of the rating, due to lack of control over the cattery between inspections. Any use of this information is made with the knowledge that it is AT YOUR OWN RISK. Please contact the breeder of your choice for any references or guarantees that they may offer, for none are provided with this list. ANY AGREEMENTS ARE THE SOLE RESPONSIBILITY OF THE BUYER AND SELLER.